"Dragon Metamorphosis" - This design employs a figure/ground reversal of the same motif in black and white versions from one side of the print to the other. 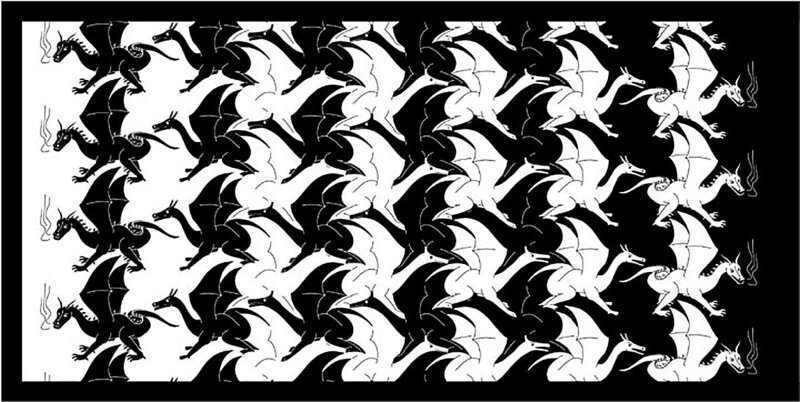 I.e., the eye perceives black dragons on a white background at left, and white dragons on a black background at right. M.C. Escher used this technique in some of his most famous prints, such as "Day and Night" . In the center a tessellation of dragons is seen in which no background is visible. In between these extremes the mind's interpretation of what the eye is seeing is not as clear cut. The entire design possesses glide reflection symmetry about a center line if the reversal in colors is ignored. Limited edition of 25 digital prints, executed in 2003. The image size is 15" x 7-1/2". A belt buckle using this design was produced by Bergamot Brass Works . The central dragon tessellation is also featured in "Drawing on Glide Reflection"
Fired clay has been used as an artistic and functional medium for thousands of years. Robert Fathauer brings relatively recent mathematical ideas to this ancient medium, with the goal of creating unique and thought-provoking sculptural forms. In many cases these are reminiscent of forms found in nature, while remaining abstract. Fractal curves are complex curves that are generated by starting with a single line segment and applying a simple rule repeatedly. Such curves can be used to generate surfaces by spatially separating the different generations of the fractal and then connecting them. 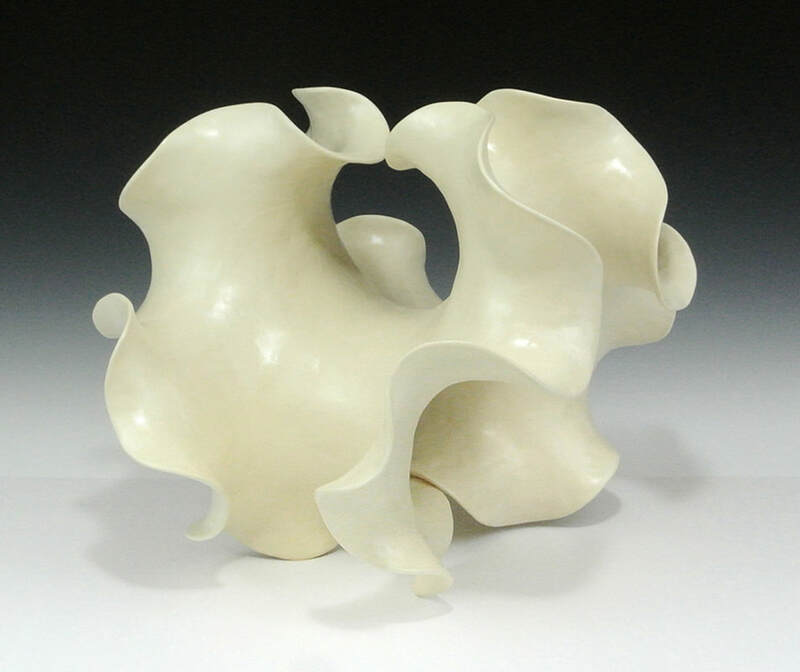 Several of Dr. Fathauer's ceramic sculptures are based on fractal curves, though the canonical curves are generally modified by creating curvilinear and/or closed versions. Spatial development of fractal curves leads to surfaces that grow superlinearly, creating ripples and folding, as is sometimes observed in natural growth structures. These surfaces are related to hyperbolic geometry (in contrast to Euclidean geometry), and they often possess negative curvature. This means the surface curves away from every point in directions of opposite sign, like a saddle. 1982: B.S. University of Denver in Physics and Mathematics, oil, and acrylic paint in his school years. Long a fan of M.C. Escher, Dr. Fathauer began designing his own tessellations with lifelike motifs in the late 1980's. He learned printmaking techniques for the purpose of producing limited-edition screen prints and woodcuts of his tessellation designs. At the same time, he designed and produced a puzzle based on a squid and ray design. In 1993, he founded a business, Tessellations, to produce puzzles based on his designs. Over time, Tessellations' product line has grown to include mathematics manipulatives, classroom posters, and books as well. Dr. Fathauer's explorations with tessellations branched into fractals, and around 1990 he began creating art primarily on the computer in order to better realize the intricate detail and complexity of his designs. His fractal tessellations led him to experimenting with fractal knots. He is also fascinated with mathematical forms in nature and has created fractal trees using photographs of real trees and bushes. More recently, he has been working with ceramics to create sculptures that combine fractal character with hyperbolic geometry. These abstract sculptural forms are inspired by natural structure found in corals and plants. In addition to creating mathematical art, Dr. Fathauer has taken an interest in promoting it through group exhibitions. He took the lead in making art exhibitions an annual feature of both the Bridges Conference, starting in 2001, and the Joint Mathematics Meetings, starting in 2004. Dr. Fathauer lives in Phoenix, Arizona with his wife Marla and sons Max and Rex. Some of these books are available at Mathartfun.